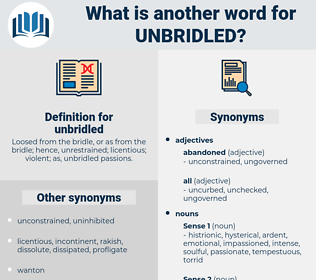 What is another word for unbridled? 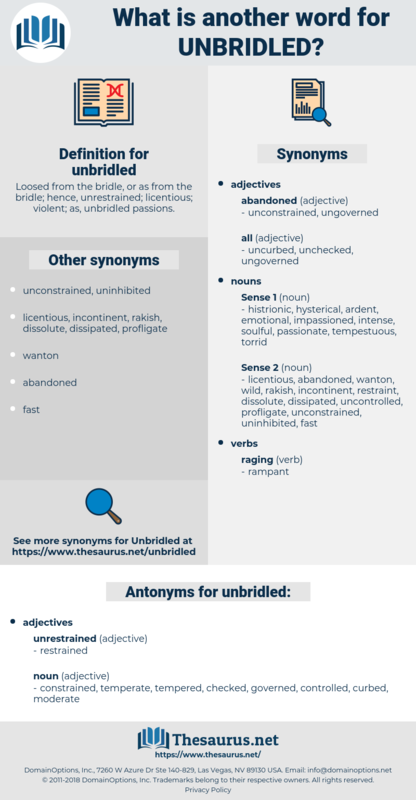 Loosed from the bridle, or as from the bridle; hence, unrestrained; licentious; violent; as, unbridled passions. unaccountable, unhindered, unsupervised, wanton, unscrupulous, wild, limitless, savage, unimpeded, disproportionate, fierce, ruthless. uncontrolled, unchecked, unlimited, unrestricted, uncontrollable, rampant, unregulated, boundless, frantic, runaway, cut-throat, unmetered. constrained, temperate, tempered, checked, governed, controlled, curbed, moderate. He was asleep, and his faithful horse was unbridled that it might crop the grass at will. How unbridled must Daubrecq's passion be for him to risk that perpetual threat of death and to introduce to the privacy of his house this woman whose life he had shattered!